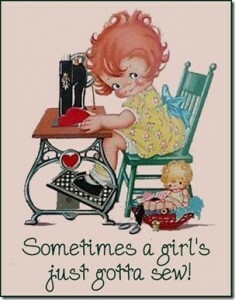 I have recently had a little problem which I hope to have solved, with a little judicious stitchery. The 13 year old is on holiday from school this week, when he isn’t at school or asleep he is generally in his room on his computer playing games either alone or with “virtual friends “ who might be anywhere in the waking world. 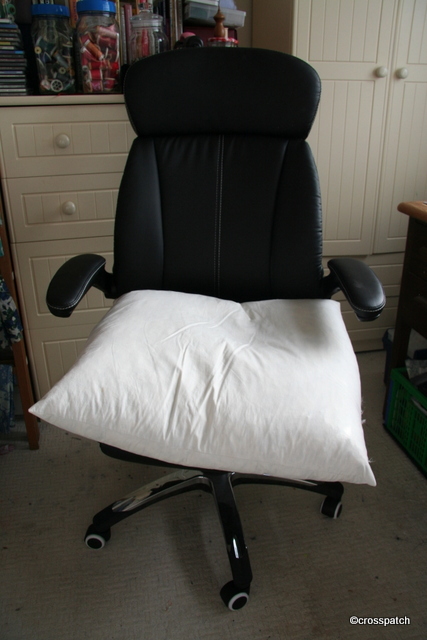 He sits on a computer chair which he finds less than comfortable so he will creep into my bedroom and take my lovely feather pillow in crisp white linen, to sit on! As you can imagine, I’m not impressed by having to sleep on a pillow which has been in close proximity to a 13 year old boy’s rarely washed, and flatulent nether regions only minutes before I retire to bed and for probably the preceding 12 hours. My solution is a feather cushion of his very own to sit on. I had one in my stash, but no cover for it. Looking in my fabric stash, apart from my check shirts which are not negotiable, I have very little which isn’t rather too girly for a boy who does not countenance anything which might blight the tender shoots of his pubescent masculinity. I found a shirt in cream and blue stripes, one of my early mistakes when buying shirts, it is striped not checked; two pairs of his father’s pajama bottoms, worn out at the seat but still plenty of wear in the legs (what does that tell you about my Dearest?) and a pair of his father’s boxer shorts size small from when he used to smoke 60 a day and had the hips of a racing snake, long time past. 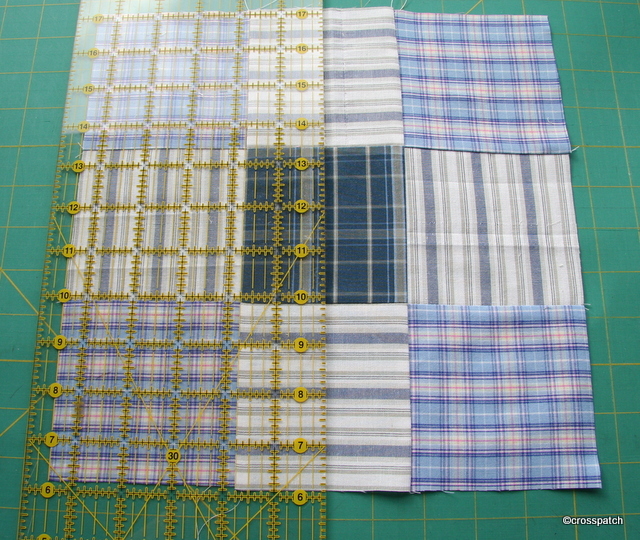 I had seen the disappearing nine patch block but had not yet had the opportunity to use it, given the proportion of fabrics I had ( 3;4;4;1) it seemed a good choice. 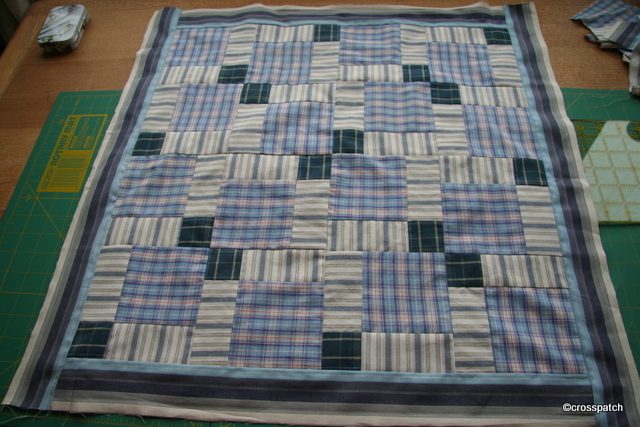 I used the darker check from the boxer shorts for the centre square I’d only need 8 4” squares. 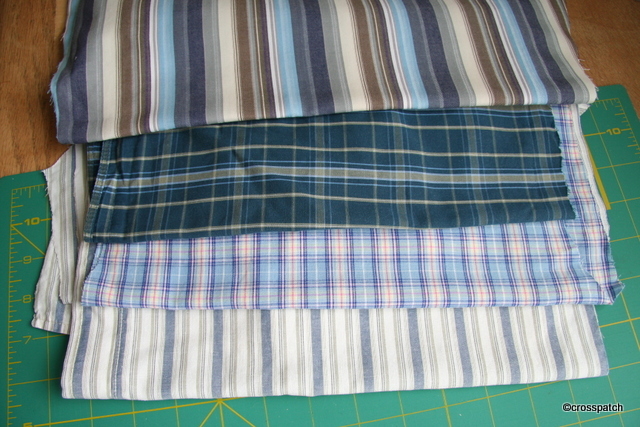 The cream shirt and blue checked PJ’s for the sides and corner squares, 32 of each, and the striped pair of PJ’s for the outer border. 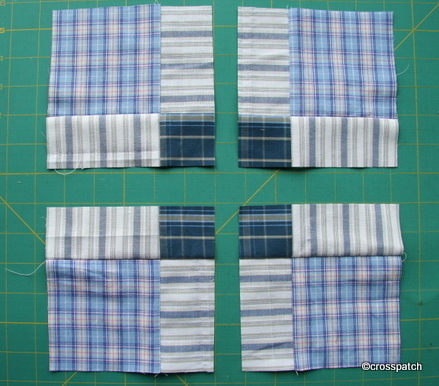 Make a nine patch, press it and slice it up again and across the centre in both directions to produce 4 blocks. I tried two different placements of the resultant squares, so the two sides of the cushion are subtly different. 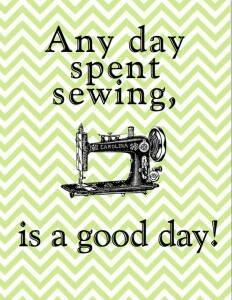 It will need a zip, no doubt it will need washing frequently, and probably an inner cover to help keep the cushion clean. The 13 year old’s room is mainly blue and cream so this will blend in fairly well, by which I mean there is nothing here for him to take offence at, he may accept it without too much persuasion. We won’t need to consider “what people might think”, or any of those other concerns so particular to 13 year old’s. Following my recent successful forays into hedgerow gathering for wine I have been considering what else might be lurking in the undergrowth which I might make use of. Rose hips kept coming to mind and eye. 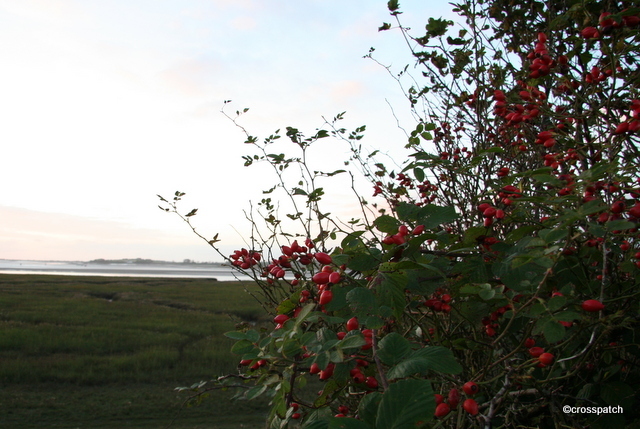 I have noticed as I drive around the country roads that the wild dog roses which can be found flowering abundantly in the hedgerows in spring are currently sporting bright red and orange hips on almost naked stems, waving at me in the autumn sunshine. Whilst the thought of making them into wine appealed, I have a vivid happy memory of rose hip syrup. When I was a very small girl, back in the far distant 1960’s my mother gave my sister and I a teaspoon of rose hip syrup occasionally, probably through the winter to ward off coughs and sneezes. 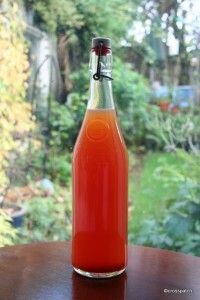 Perhaps she had happy memories of rose hip syrup herself being a child of the war years when rose hip syrup was made from hedgerow pickings and given free to children, because it is an excellent source of Vitamin C,( 20 times as much as oranges) which would have been a scarce resource in war time when citrus fruits were unavailable and leafy vegetables seasonal. 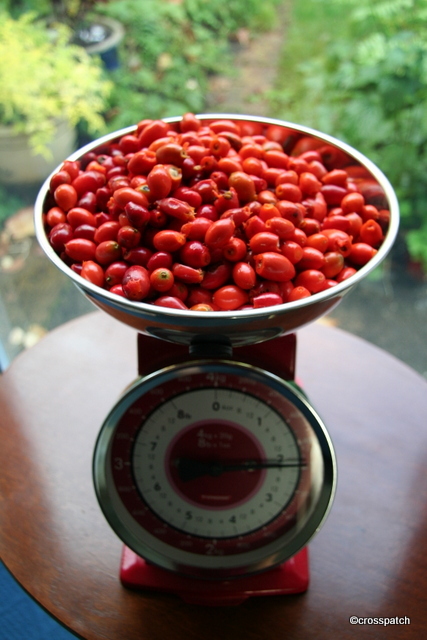 Then a blog I follow, lovely greens did a blog post on making elderberry syrup, (Hmmmm)… decision made, Rose hip syrup it is! I waited a few days of windy and rainy evenings, till we were blessed with a calm clear day, and went off to my usual gathering spot; a cycle path on the Lune estuary near Glasson Dock. 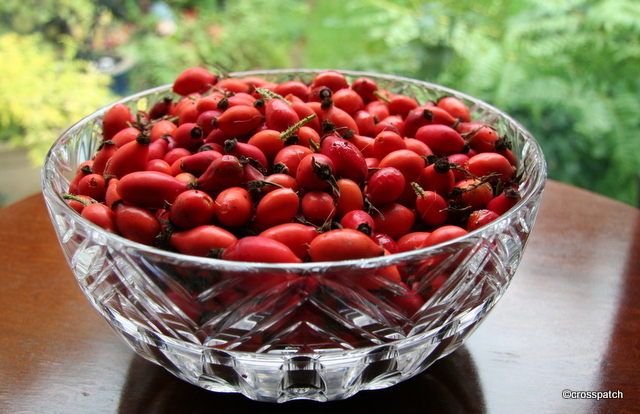 We found rose hips in abundance, but the sun was going down. We only managed to pick half of the amount I needed by the time the sun set at the mouth of the estuary. My Beloved having been prickled and scratched, insisted we went home before we found ourselves benighted. As we walked briskly back to the car, on our right towards the west the sky was lit up in shades of coral and gold by the sun, already set, while on our left the darkening sky was lit by a beautiful full moon rising over a copse of beech trees. I had my camera with me but was being rushed back to the car in case it went so dark we got lost!!! As we drove away from the car park we were passed by my sister and niece, waving enthusiastically they were arriving for a leisurely stroll in the dusk, a moonlit walk, how lovely, Dearest! 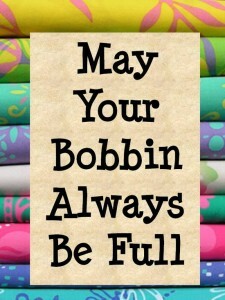 Do you think we should send out a search party or might they have found their way home?